The Flare series of solid-state relays from Wieland are available with either 60VDC at 5A output or 250VAC at 4A or 6A output. Both models are bridgeable with screw style terminals and are designed for DIN rail mounting. The Flare series of solid-state relays from Wieland are available with either 60VDC at 5A output or 250VAC at 4A or 6A output. Both models are bridgeable with screw style terminals and are designed for DIN rail mounting. The Flare series are 12.5mm wide for the 5A and 4A models or 25.6mm wide for the 6A model. 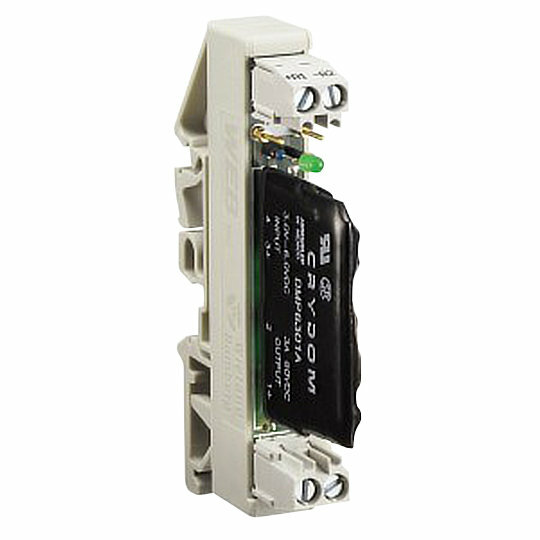 The Flare series of solid-state relays come with high visibility LED indictors and the ability to connect up to 20 modules via pluggable jumpers.